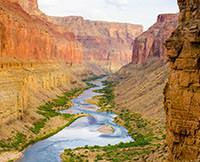 Everything fell into place just as planned on my Grand Canyon rafting trip. It was very easy to get the reservations all arranged. And, the pre-travel info was thorough. If one does what you suggest (re: what to pack, etc.) all goes well. I had a fantastic time. Wonderful trip! Youve obviously been doing these for a long time. Everything fell into place just as planned.